Early this year, I managed to persuade my parents to get a vermicompost kit. Before that, I mostly threw fruit and vegetable peelings in an open heap in my garden, which irked my parents, as they said it attracted the odd rat to our home. I still do it when they are not looking, but it’s mostly weeds and leaves that I throw in that heap nowadays. Waste management is an issue that we all need to be mindful of. Most people think about their trash for as far as the eye can see, and that it is something that will take care of itself. All our trash in Singapore is incinerated and then disposed of at Pulau Semakau, but even that is slowly running out of space, and soon we will need to find a new island to bury Singapore’s waste. But that is not the real solution, we really need to cut waste at its source, which includes buying products with minimal or no packaging, and by minimising what we throw away by repairing, reusing, upcycling and/or recycling what we can. Food waste is another issue that needs more attention, and to find out more about what we can do in Singapore, visit the Save Food Cut Waste webpage. Rather than dispose of our fruit and vegetable peels, we can compost them in a few ways to get nutritious, well, compost, which you can use on your plants. To find out more about the merits of composting, and what you can compost, here is a great resource. 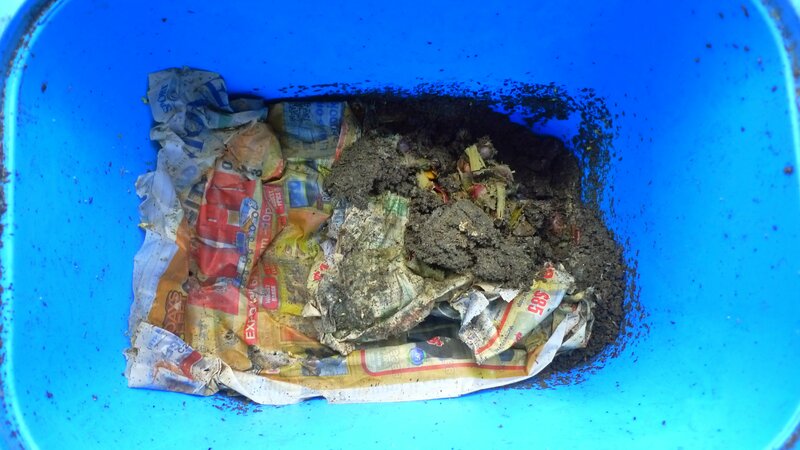 For apartment dwellers, the best options are vermicomposting and the Bokashi bin, as they do not take up much room, or a simple DIY version can be found here. For those who have a garden, larger composting units are available; there is the Tumbleweed Compost Maker, or you can even make your own with a large dragon pot with a lid, and there are other variants. 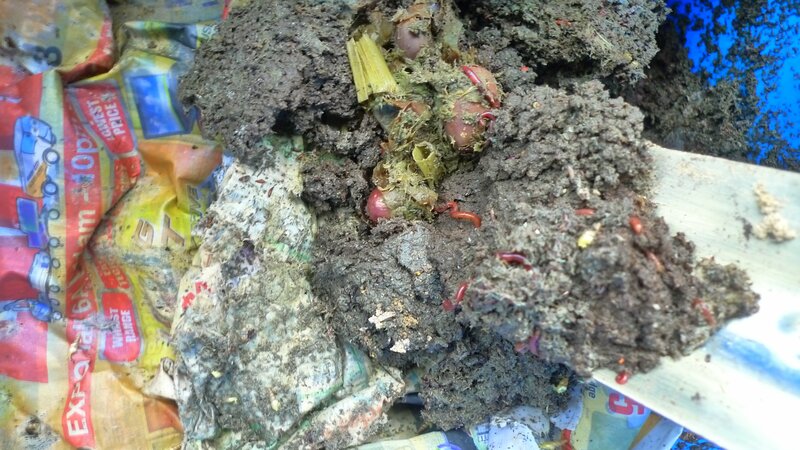 Vermicomposting uses worms, which has a three-fold benefit for me. 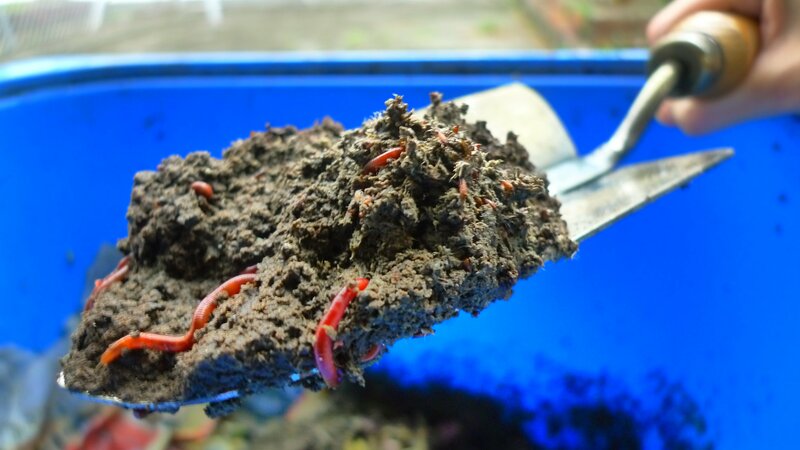 I get more worms for my garden when they multiply in numbers, worm casting as compost, as well as worm tea, a liquid fertiliser. I got mine from Olive Ventures, but you can get yours at Terracycle for S$110, as Olive Ventures works closely with Terracycle in providing vermicompost kits. 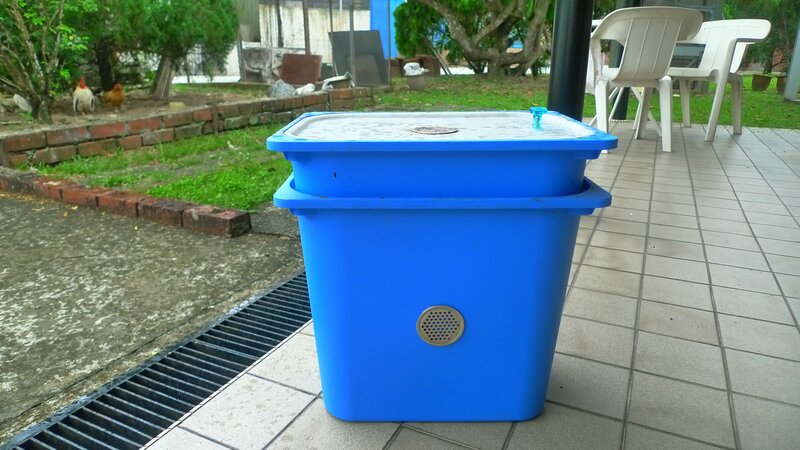 Of course if you don’t like worms, there is always the Bokashi Bin, a similar model retails for S$180 at Qoo10, but I’m not sure where you can get the Bokashi One Mix, which is essentially sawdust mixed with bran and micro organisms, you can write to Alpha Globo for more information (click on Shop Info on this page). You will still need to find a place to bury the rotted down waste, so a bit of logistics is required here. Compost bins that can be rotated break down food waste a lot quicker than stationary ones. The Tumbleweed Compost Maker is available for S$269 at Organic Origins, they also sell the Tumbleweed Worm Factory at S$199. My friend Bhavani Prakash demonstrates on her wonderful blog – Eco Walk the Talk – how to make your own compost bin using container pots, see here. They can be used indoors or outdoors, but sun exposure and moisture helps to break down food waste quicker. In Australia, my boyfriend uses a large plastic compost bin in the garden. It is a vegetarian household so there is always lots to compost, along with tea bags, weeds and plant cuttings. 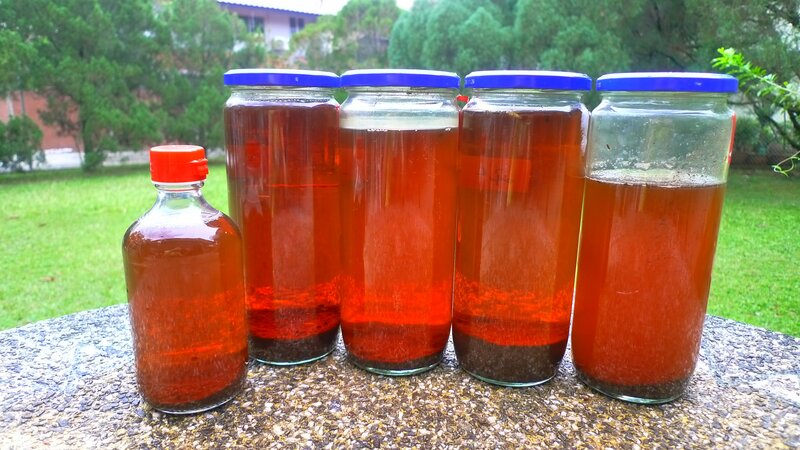 Another way to turn fruit and vegetable peelings into another useful resource is by fermenting it for three months in water and molasses. During this time, it will be transformed into “garbage enzymes” and it can be used as a household cleaner or liquid fertiliser. To find out how to use it, see here. 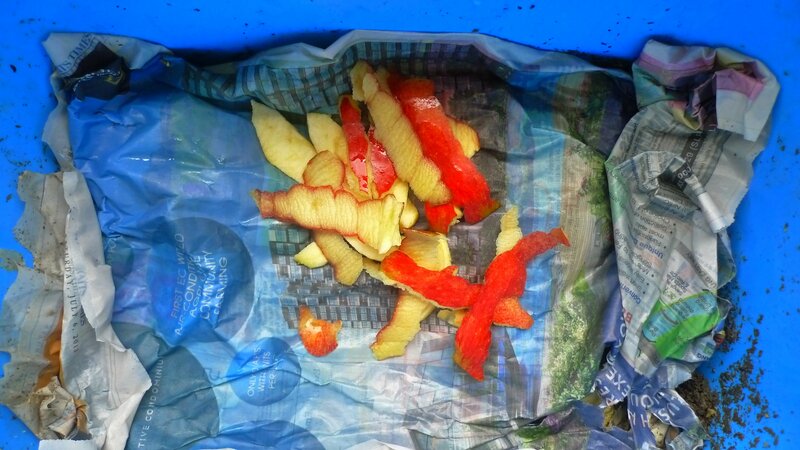 I have to admit that I’m quite partial to worms, but for fruits and vegetables that have gone off, I put them in a container pot. I make sure I give my worms the best food possible, mostly spray-free or organic. Maintaining a vermicompost is easy. Here’s a closer look of what the bin looks like after I dug into it a bit. I place damp newspapers between layers of fruit and vegetable peelings to keep their bedding moist. It also ensures that ants don’t move in. Worm bins should not smell, mine smells pretty good! What I look forward to doing each week is collecting worm tea. I dilute it for use on my plants. According to Terracycle’s website, one should dilute it with aged water at a ratio of 1:100. I’m thinking of selling my excess worm tea in the near future, seems like it is worth a fair bit. If you don’t already compost, I hope you’ll consider it after reading this post! Amazing resource. If you dont mind sharing, how long did it take you to collect that amount of worm tea? Hi Joe, that took me around two and a half to three months I think. Each large bottle is equivalent to a litre. These days they are a bit slower, I think it has to do with the explosion of snails and other critters in the worm bin. Hi, are you up to share some of your worms to start a new colony? We moved to Singapore recently, and we had to leave our little friends behind, for free. And now, our garbagges are so big because of that, that I want to do it again ASAP. So I’m looking for someone willing to share. In my philosophy, worms should be exchange for free. I didn’t do anything to make them grow, so I didn’t ask for any money when I gave them. If you have tricks or know someone, let me know. I’d love to share some of mine, but my bin has a lot of snails and some other critter in it, which came with the bin (grr). I might have a friend who can share worms, but they’ve just had a baby so it’s probably not the most convenient time. Could you email me at lambchopra(at)gmail.com and I’ll get back to you on this?